Bedlam adds race and imperialism to Shaw’s study of class divisions. Patrick Maley reviews. Surely George Bernard Shaw’s 1913 play, Pygmalion, has never been more visceral and captivating than it is in the hands of director Eric Tucker and his stellar Bedlam theater company. With Tucker as Shaw’s linguistic eugenicist, Henry Higgins, and Indian-born Vaishnavi Sharma as his greatest creation, Eliza Doolittle, the conflict at the center of the play transcends the class differences that fascinated Shaw by taking on pronounced shades of racism and imperialism. It is a bold insight by Tucker that comes to life on the strength of stellar acting and directing. The source material for My Fair Lady, Shaw’s play opens with a chance meeting between Higgins, a professor of phonetics, and Eliza, destitute and selling flowers on the street to earn whatever coins she can. Higgins marvels judgmentally at the lack of upper-crust refinement adorning Eliza’s speech (Shaw writes her as Cockney), and brags to bystanders that he trains people just like her to access high society through finely honed speech patterns. Offended, defiantly dignified, but nonetheless desirous of social mobility, Eliza surprises Higgins at his home the next day to request his services. He begrudgingly acquiesces mostly as a matter of pride: transforming this girl would put his powers to the greatest test. A fierce social critic, Shaw crafted Higgins as a member of the pompously powerful class that look with disgust on all those who dare to be less wealthy and dignified than them. By giving us an Indian Eliza, Tucker makes Higgins considerably more objectionable and sinister. Sharma’s Eliza is not only poor, but also desperate and vulnerable, very far from home in the land of her nation’s colonizer. Sharma crafts a sharp-tongued, proudhearted Eliza, but not one that is in any way delusional about her social condition. She all but lays her soul bare in the request for Higgins’s help, throwing his selfish opportunism into stark relief. Bedlam emerged as an innovative theatrical force through their previous encounter with Shaw, a four-person Saint Joan, and since then they have had great success with similar treatment of Hamlet, Twelfth Night, and Sense & Sensibility. 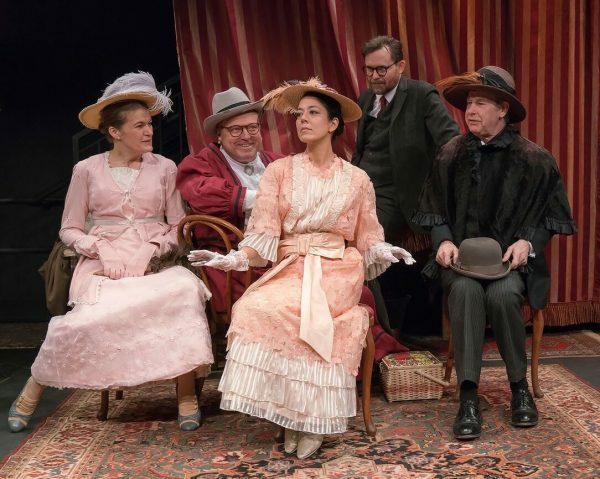 Their signature stripped down, intimate theatricality and nimble casting emerges again in Pygmalion: some staging happens in unexpected places and actors jump between roles rapidly at the swap of a hat. But the core of Bedlam has never been this kind of theatrical playfulness. Instead, the unique staging and casting works toward the greater goal of unpacking the heart of the play. In Pygmalion, Tucker and company have effectively stripped away any sense of cheekiness in an effort to accentuate the real psychological violence at the heart of Higgins’s work with Eliza. The other stalwart of Bedlam is fine acting, which runs throughout Pygmalion. Nigel Gore’s Colonel Pickering does important work as a more empathetic if not entirely sympathetic counterpart to Higgins, Rajesh Bose is a delightfully cocksure Alfred Doolittle, and Edmund Lewis shines as Mrs. Higgins in a frumpy dress and Victorian sensibilities. But at the play’s center is the powerful, frequently gripping clash between Tucker and Sharma. Both create characters deeply committed to their ideals, and no quarter is given as tension between them mounts throughout the play. Sharma is particularly excellent in showing Eliza’s growth into self-awareness. Her initial desperate reliance on Higgins evolves steadily into a realization that she may have entered a Faustian bargain with a devilish deceiver. Sharma does impressive work to show us Eliza variously bewildered and determined as she searches for some sort of sustainable identity. Ultimately, this is a quite human and productively troubling Pygmalion. In a small playing space filled with confident, unadorned acting, we come face-to-face with the malevolence of Higgins and Eliza’s anxieties. In returning to Shaw, Bedlam shows again its singular ability to access and accentuate the timeliness and immediacy of classic theater. Pygmalion runs to April 22, 2018. More production info can be found here. Patrick Maley is an Associate Professor of English at Centenary University in Hackettstown, NJ, and the author of After August: Blues, August Wilson, and American Drama (University of Virginia Press, 2019). His work also appears in Modern Drama, Theatre Journal, Comparative Drama, Field Day Review, Eugene O'Neill Review, Irish Studies Review, and New Hibernia Review. He also reviews theater regularly for The Star-Ledger and NJ.com.